In a recent blog entry, game designer Zak Smith aka Zak Sabbath made a fairly exhaustive attempt at rebuking GNS theory. This post is a response to one of his central contentions. 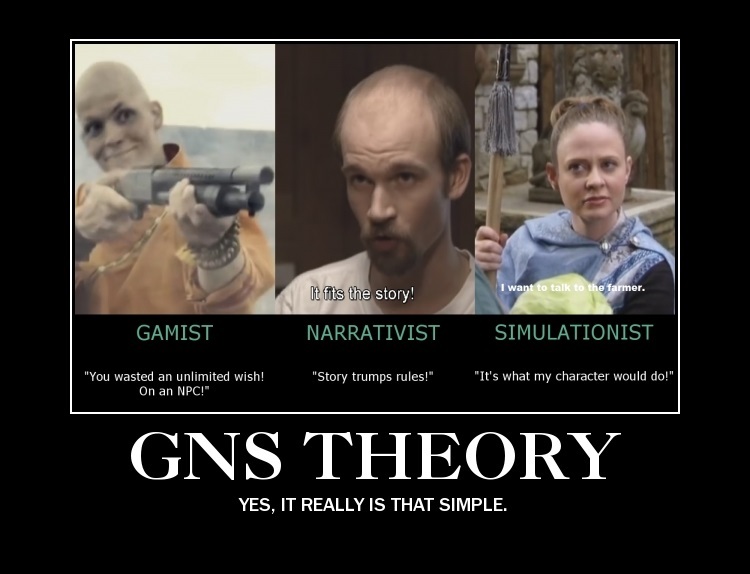 There is a companion blogpost that takes a further look at GNS theory and tries to boil its central components down so that they are easily understandable for everyone. The dice are kind. Sinister goes down. Colossus has achieved a “simulationist” (or is it dramatist?) goal of acting in character plus arguably a narrativist goal of being in a story of overcoming insecurities about his contributions by seeing teamwork as the answer. What a thematically satisfying moment. Wolverine has achieved a “gamist” goal of devising a strategy to take down Mr Sinister. Challenge defeated. Plus also maybe a “simulationist” one because that’s how Woverine acts: he kicks things asses. […] Was a goal prioritized? […] Is this moment not an “instance” of play? Simultaneous satisfaction? For a given instance of play, the three modes are exclusive in application. […] So in the course of Narrativist or Simulationist play, moments or aspects of competition that contribute to the main goal are not Gamism. In the course of Gamist or Simulationist play, moments of thematic commentary that contribute to the main goal are not Narrativism. In the course of Narrativist or Gamist play, moments of attention to plausibility that contribute to the main goal are not Simulationism. The primary and not to be compromised goal is what it is for a given instance of play. The actual time or activity of an “instance” is necessarily left ambiguous. What if Colossus and Wolvie had the option to blow up Mr Sinister at the price of killing innocent bystanders? This would be arguably out of character for either of them, therefore go against Simulationism, but it would mean certain victory thus might appeal more to players with a Gamist bent – who care about winning the most after all. What if the two superheroes had the option to talk to Sinister, find out more about his background and motives, perhaps thrusting the story into a new direction? This might appeal to narrativist players, even if it might be out of character again or if meant fewer rewards for not outright defeating their enemy. The obvious existence of such alternatives would have made player priorities in that moment apparent. Each player would have been forced to choose for themselves, according to their own preferences, or, ideally, negotiate with the other to reach a compromise course of action in case of conflicting priorities. The above quote about GNS theory, in fact, expresses that at times a course of action may satisfy more than one mode. However: Gamism means that in cases where a players has to choose, he’ll choose the Gamist path most of the time, whereas a Simulationist will most frequently choose the Simulationist path and so on. GNS theory therefore claims that such priorities always exist for each “instance of play” (each player has one overarching priority for a session or campaign) – even if not always made explicit by the situation at hand. And that each player in each instance of play has one and only one priority, if hard-pressed. Now, these may vary in time but observation holds that players tend to gravitate more often to one mode than the other two, thus leading to classification of role-players as Gamists, Simulationists or Narrativists – and by extension to the classification of game mechanics and whole RPGs that specifically cater to such player preferences by design. GNS has many problems but this isn’t one of them. The three modes of play/Creative Agendas are a valid observation. More about that in this blogpost over here. The example you cite disproves a SPECIFIC PREDICTION of GNS. Your blog entry here only makes sense if you believe in an interpretation of GNS that doesn’t make this prediction which is, therefore, different than Ron Edwards’. Your rewrite of the situation is irrelevant: GNS claims a thing _can never happen_ yet it happens all the time. While you may claim some _new version_ of GNS is dependent on what happens when players must choose between imperatives , this isn’t the actual form of the theory. The idea that “sometimes players choose this over that” is barely a theory and makes no predictions. What I did was prove a specific prediction of GNS was false. What you did is suggest a very generous and vague prediction of GNS (“sometimes some players will choose one imperative over another”) is true but trivial: everyone knew that befoe GNS theory. First of all, I appreciate your swift reply. For a given instance of play, the three modes are exclusive in application. […] So in the course of Narrativist or Simulationist play, moments or aspects of competition that contribute to the main goal are not Gamism. Let me ask you: how do you read this? Edwards’ statements seem to be somewhat contradictory in that the first one postulates exclusiveness and the second one a mix of two or more modes of play. One thing seems to be clear though: it is only gamism when competition takes over as main goal. It is obviously about *prioritization*, wouldn’t you agree? I guess the key question is: does exclusivity further above refer to more than having one single priority among those modes of play? Does it say more than: you can’t have two Creative Agendas that you value equally, one CA always dominates when you’re being hard-pressed? Either GNS _makes no prediction_ and cannot draw a line between different kinds of play (in which case the theory is meaningless and useless for any purpose) or it makes an inaccurate prediction (an exclusivity which does not exist). Although “instance” was not defined when I wrote that, I’ve defined it since: at least one full reward cycle of play, which for most games is at least a single session and often more, and for some games, considerably more. So Frank, your five-minute comparison is valid but not at all relevant for talk about Creative Agenda. So, if I am reading Edwards now correctly, Creative Agenda is a kind of attitude you bring to the table: “I play this D&D campaign to level my character up and get magic items” or “I want to play as Wolverine as faithful to the original character as possible” or “I want to explore the conflict of honor versus love.” Which means: if you’re that (Simulationist) Wolverine player, moments of Gamism or Narrativism are okay, for as long as that overarching goal does not get compromised. And if that gets compromised by your fellow players repeatedly, dissatisfaction ensues. If my new reading is correct, the “prediction” of GNS is: players have an overarching (and not necessarily explicit) goal regarding one or more sessions of play. And that goal is exclusive (but may change in time). Other modes of play are okay as long as they don’t compromise the fully prioritized mode of play. If you have any questions or comments about the post I made over at Adept Play, just let me know. Here, in some other post you make, or in email. I may not be able to respond quickly, but I will respond. The long and short of it is that I asked Ron Edwards why he didn’t look at specific, atomic events in gameplay (see Zak Smith’s “Fastball Special”), not even as an aggregate of them, but defined Purpose of Play instead as the above mentioned overarching purpose. your marco and micro are NOT different views on the SAME thing, they are simply views on different things. Can you briefly demonstrate that this is a valid observation? Purpose of play IS disconnected (definitionally and conceptually, without preventing some non-rigorous association) from anything atomic. It’s defined that way for what looked like good reasons at the time – reasons which still look good to me all these years later. Can you state these reason so that they can be independently verified? So, to my eye, your concern over that micro/atomic stuff makes sense: yes, they’re there, and yes, they’re important. And they ARE in the GNS/Big Model. They are NOT, however, *in* the Purpose-bucket. Though, like everything else, they *can* (again, non-rigorously) influence and/or be informed by that bucket. Why are they not in the Purpose/Creative Agenda/Modes of Play bucket? What is the relationship of that bucket to atomic events or even the aggregate of atomic events, if it’s different from that aggregate? Managing all those potential micro-competitions can be a big deal, obviously. But at NO point do we cross some line and say “oh, the purpose of play must be competition!” because of all those micro-events (which probably aren’t “only” any one thing anyway). Ties into the above but that is by no means clear. I think to the contrary that even a single atomic event might give strong indication as to where the preference of a given player may lie. Can you make your case? I think you understand that this cannot be taken at face value. That is the problem. It has been how many years since then? And there’s still not a single central document I know of that both explains the Big Model in readily understood terms and summarizes the justification for why it was chosen this way. If you want to answer those questions here in the comment section, please be my guest. I’d appreciate it. Alternatively, if you want to do so in a guest post here on this blog for the benefit of my readers and subscribers, please let me know and we can discuss this. I’ll answer your questions to me in a separate reply below. On macro/micro as different things: admitting that it’s really hard to summarize reams of discussion from years ago, and it’s hard to want to spend much time on it when the interesting stuff mostly lives elsewhere (even Ron doesn’t really talk in terms of “CA” nowadays), the key thing is that they are DEFINED as different. You can call that “cheating” if you like, but really – within Big Model/GNS, it’s not a debatable point. What game-participants like in/about any given micro-decision is simply a thing that ISN’T Creative Agenda. Stating reasons: Well, one reason is that liking/not liking atomic bits in/about play is an individual experience that can easily devolve into un-useful “I say I like it and that’s that.” A “what we see over time as the purpose of play” perspective at least has a chance to avoid un-resolvable issues about “what was in x, y, and z’s head”. CA shows up as a group effect, not an individual preference. And the whole reason for talking about something like Creative Agenda at all was to acknowledge that while differences at the micro scale are often (NOT always) inconsequential to the shared enjoyment of play, there does seem to be something at the more general scale that CAN prevent shared enjoyment. Which begins to answer your next questions, about why micro/atomic stuff isn’t in the Creative Agenda bucket – preferences at that micro scale are hugely varied and not as obviously obstructive to shared enjoyment. Again, group vs. individual is REALLY important. As far as a case that single atomic events don’t really give clues about CA preference, all I can say is years of attempts showed that to be folly. The preference revealed by a single atomic event is not a CA. If you see a buddha on that road, it isn’t a true buddha. On the frustrating absence of full, readily understood explanations … I was involved along the way, and I’m under no illusion that my understanding is complete nor that my ability to communicate my understanding is exceptional. This “CA isn’t a sum of micro-choices” thing, though – really, it isn’t. Again, it’s hard for me to dwell on that when the current mode of discussion just focuses on Purpose of Play and tries NOT to rely on any document/huge set of old discussions, but … talking accurately about CA specifically will require understanding what I’m addressing here. Ron’s invitation to post in Actual Play (which I unknowingly echoed in my post) may ultimately be more fruitful than comments like this, but I guess I’ve still got a little old-school Forge in me. Again, thanks for the explanations. I have to admit, however, that I find them somewhat dissatisfying. the key thing is that they are DEFINED as different. You can call that “cheating” if you like, but really – within Big Model/GNS, it’s not a debatable point. It’s not so much that I would consider that cheating, I would consider it arbitrary, lacking verifiable justification. You can of course define any concept you want to, that’s no problem, but you need to be able to demonstrate that it makes sense/is useful. Otherwise, it will make people tend to shrug, don’t you think? Well, one reason is that liking/not liking atomic bits in/about play is an individual experience that can easily devolve into un-useful “I say I like it and that’s that.” A “what we see over time as the purpose of play” perspective at least has a chance to avoid un-resolvable issues about “what was in x, y, and z’s head”. There is a reason why both Game Theory as well as Game Studies are interdisciplinary fields that both draw on Psychology. You can, of course, pursue exclusively a Humanities approach and observing people like an Ethnographer. No problem with that. But black-boxing the internal state of participants means we have to presume a-priori that you’re leaving important stuff out. The burden of proof would be on anyone pursuing such an angle that the resulting theory or model is still complete. I have not seen such an argument effectively being made. I have asked Ron Edwards for it, his reply video to me stated that he just doesn’t care about it. Alright, but then he’ll have to live with people asserting that all of his ideas amount to a partial model at best. I very much doubt that, to be honest. Groups have been falling apart over very specific events. Ragequitting is the result of frustration over micro-events that reflect a clash of overarching goals. But it manifests in the concrete (it may build up though). there does seem to be something at the more general scale that CAN prevent shared enjoyment. If it (the prevented shared enjoyment aka dissatisfaction) does not manifest – and all manifestations are local events – it does not exist, does it? An overarching purpose like a Creative Agenda cannot exist entirely detached from singular events. If it was entirely detached, it would be undetectable. All detection is local. Which then begs the question of the relationship between overarching agenda and individual decisions. As far as a case that single atomic events don’t really give clues about CA preference, all I can say is years of attempts showed that to be folly. The preference revealed by a single atomic event is not a CA. Again, you can define CA anyway you want but it requires justification. And pointing to some lost knowledge in the Forge archives is both dissatisfying and unconvincing. And I have no stake here – I am neither pro-Forge nor anti-Forge. Also, I have much sympathy for not wanting to relive arguments of the past but that could have been easily avoided by applying scientific standards and producing a single document that makes all the assumptions and conclusions verifiable. In lieu of that, what would anyone expect but shrugging? Not trying to be mean but this isn’t scientific. I’m not interested in esoterica (although I am no stranger to that by any means – while the Threefold was being forged over at rgfa, I was busy smashing my own enlightenment in alt.zen), in secret knowledge, in metaphysical concepts whose relationships to specific observable phenomenons are not concretely and verifiably defined. Not when it comes to the field of RPG Theory, at least. If you see a buddha on that road, it isn’t a true buddha. Why would you have so little faith in your own eye? when you say your game wants to take simulation of the fantasy genre to a new level, what do you mean? Yes, combat is not everything but if we look at Conan, LotR or A Song of Ice and Fire, which kind of form the canon of mainstream fantasy, we will find that combat is one central element to it. Particularly in their adaptations on film. How is a new level of simulation something to be desired, as opposed to just being a great game inspired by x, y, z cool fantasy-stuff? Genre simulation as suggested is more immersive than other fantasy RPGs for those who crave such an experience. For them, simple a hitpoint mechanic does not reflect the life and death of such legendary heroes and takes them out of the fiction to some degree. And, to the contrary, a combat system that captures the dynamics of cinematic combat with its sequences of attack increases the immersion in comparison to games that feature alternating attacks only. It makes you feel more like a cinematic fantasy hero. Fantasy role-playing at its core (even role-playing at its core, I will refer you to games like Call of Cthulhu, Shadowrun, Star Wars, Dark Heresy) is not about creation. There is a strand of RPGs that promotes creativity more than others, that is true. But the focus of the above-mentioned games (and Knights of the Black Lily) is not that. The focus is on adventuring, first and foremostly. And… the adventure is in the odds. So … as a Forge Original (to coin a label), and a nigh-D&D Original (I started with the 3 books around 1977), I have to say that perhaps the most important issue explored at the Forge was that role-playing was NOT, and had NEVER been, ANY one CA-like thing at its core. The “core” always depended on what was prioritized during play. And “creation” (in various details, including especially shared story creation), initially based on a fantasy canon that couldn’t even imagine association with a word like “mainstream”, was, and remains, one possible core. Also – because you use it (understandably) casually-but-significantly when you say “more immersive” … The word “immersion”, at the Forge and anywhere I’ve seen it discussed (from usenet to rpg.net, in blogs or at G+ and beyond), is a very, VERY tricky word. Everyone thinks they know what it is, often only to discover it means something different to all four people they were talking to. And the details of those differences often matter very much to each of those four people. My assertion was that the role-playing mainstream has been prioritizing adventuring (and still does). Here, story happens as a pure by-product of going out on an adventure. The adventure is the core. This is markedly different to, for example, Dungeon World where story is constructed out of atomic story elements, called Moves, which snowball (cascade). Here, story is not incidental but moved quite to the center, even if it’s an adventure story. It is being prioritized. However, any such approaches to role-playing are niche, to this day. And that, by the way, includes campaigns that prioritize story using, for example, D&D. All this is just a fancy way of saying “I (and I believe most fantasy gamers out there feel the same) don’t play fantasy RPGs to create a great fantasy story. I play fantasy to go out on an adventure like Conan, Frodo or Jon Snow. Story creation just happens along the way.” It’s not collaborative story-telling first and foremost. For me, it’s about facing the odds. And I would add that it’s important to me that the adventures of my fictional RPG heroes play out comparably (which doesn’t mean ‘the same’) to the above mentioned epics. I want the combats to be reminiscent of movie combats. I want the twists and turns of story to be comparable to the twists and turns in those stories (and metacurrency can help with making that a part of adventuring). I want magic to be both wondrous but still usable in gameplay, again inspired by fiction; it sets the proper constraints for adventuring. This website and this game exist because current games have not been able to deliver to my heart’s content. As for ‘Immersion’, let’s just go with Merriam-Webster’s please. Or Oxford’s.